Here in the south lies a delicious little known dessert originating from the Civil War era. 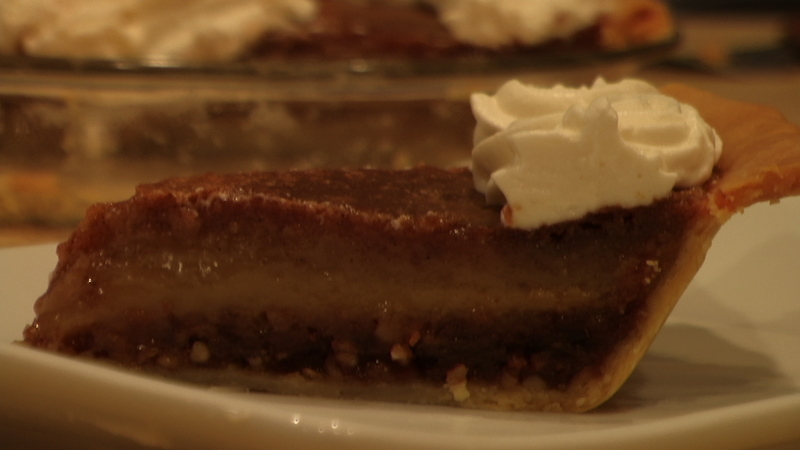 It’s name you ask… is Jefferson Davis Pie. 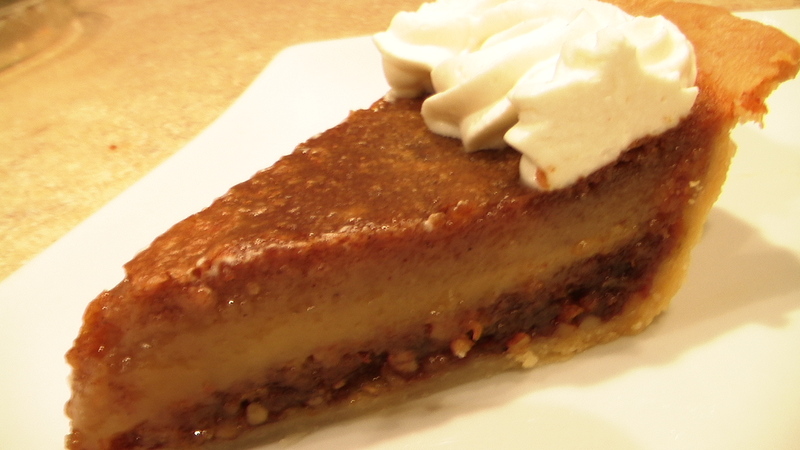 This simple brown sugar custard laced with dried fruit and nuts is named after the Confederate leader. 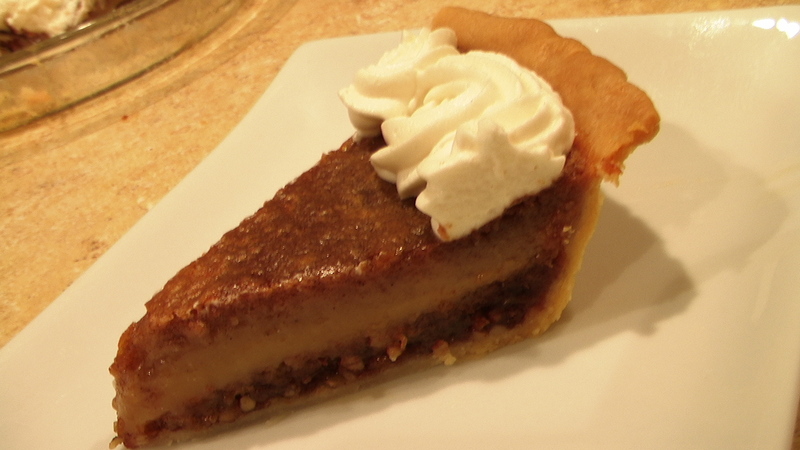 Jefferson Davis was not the only civil war era leader to have a pie named after them. Mr. Robert E. Lee inspired a cake filled with lemon curd. Quite possibly a future test formula so stay tuned! Now back to Mr. Davis. Before one should concern themselves with the custard it is crucial to establish a perfect basis for the custard to set. This basis being the pie crust. For a bottom crust of any pie, one should always choose a mealy pie dough recipe over flaky. Mealy has less butter and more open to receiving juices excreted during the baking process. Therefore when the pie is finished baking it will absorb the flavors of the above layer without causing the bottom crust to become soggy. Of course if you find yourself in a pinch or are too lazy then the Pillsbury Dough Boy can always come to the rescue and magically unroll your pie crust before you. This can save you an extra tedious step. Once the crust is pressed into the pie plate be sure to chill it while preparing the custard and fruit/nut mixture, regardless if you’re using a homemade mealy pie dough or the variety constructed by Pillsbury and his processed cousins. Although I thoroughly enjoy the fruit/nut portion of the pie, I don’t feel it should be suspended in the custard as many formulas require. I desire a smooth, sliceable custard with the perfect flavor combination of sweetness and spice without any crunchy or chewy distractions hanging about. To simply solve the problem, process the fruit and nuts together until finely ground and press the mixture into the chilled pie dough. This creates a beautiful layer of fruit and nuts when sliced and continues to compliment the flavors of the custard poured above it without being a noticeable distraction. Having resolved the problems with soggy crust and distracting fruit and nuts the next step lies with the finicky custard. In case you didn’t know, custard and I have never been the greatest of friends. However I’m trying to get to know it a little better with each baking experiment. The biggest issue with me and custards is texture. Baking the pie longer at a lower temperature allows the custard to set up to the proper firmness and the crust remains golden. 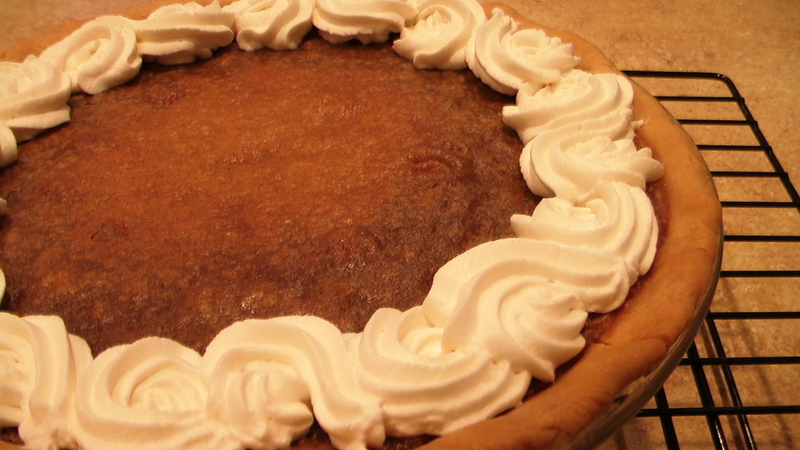 If cooked at a higher temperature, the outer edges of the custard would burn along with the pie crust before the center ever set. Besides altering oven temperature and cooking time, heavy cream needed to replace milk in order for that slice to come out perfectly smooth. The cream thickens the texture and feels silkier on the palate. It also contributes a richer flavor. Which brings me to the next topic. How to achieve the balanced flavors of sweet and spice. The secret for this custard is to hold back on the sweet. Less brown sugar allows the subtle cues from the spices to shine through. Once the pie has baked and cooled completely there is one final addition to enhance the flavor to mouth watering level. The addition of a homemade whipped cream. 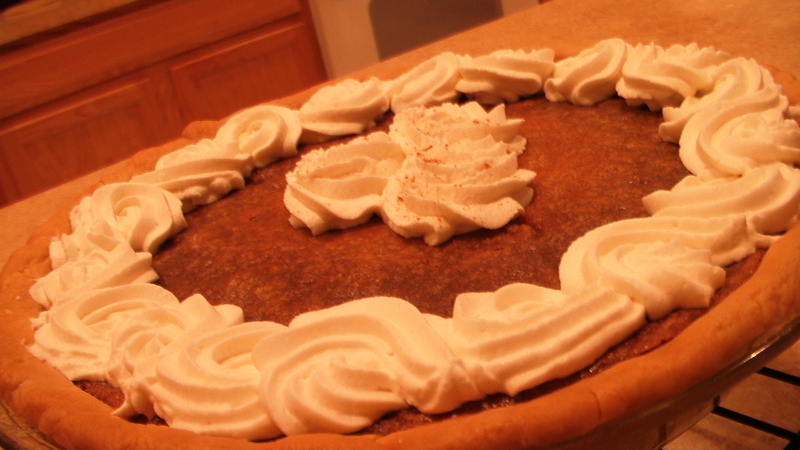 This is where I stress not to cheap out and dollop the pie with Cool Whip or spray a rosette of Redi-Whip on top!!! 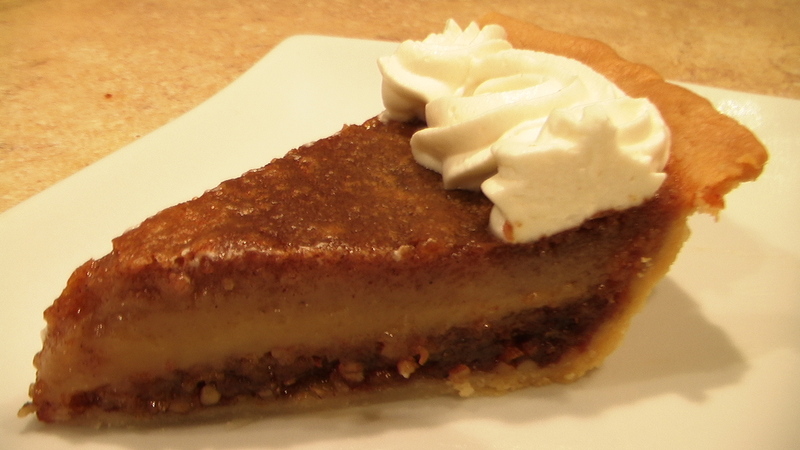 Why spend so much time creating this elaborate flavorful pie just to disgrace it with a bland processed variety of whipped cream when it is so simple to make from scratch. Honestly it takes no more than three minutes to whip up with a mixer. At times I have been known to whip by hand and still come out under five minutes. 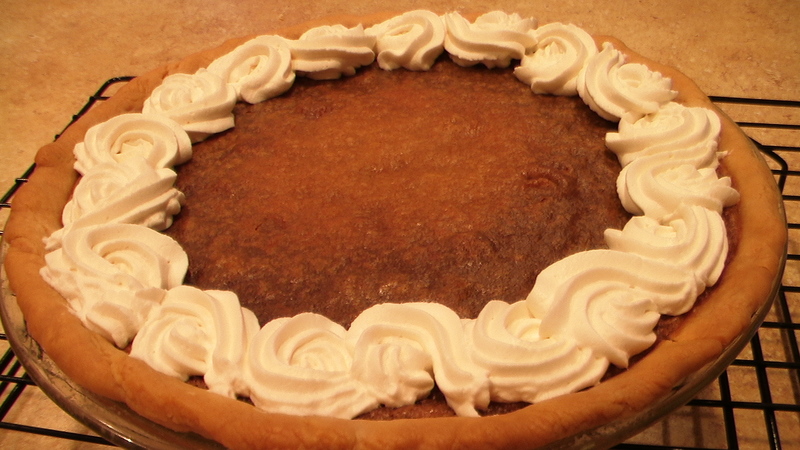 I will provide a quick and easy recipe for whipped cream below, however this pie also tastes great with a scoop of vanilla bean ice cream. If you do choose to whip your own cream, make sure to keep the heavy cream as cold as possible to shorten the whipping time. You may even place your whip attachment and mixing bowl in the refrigerator to speed up the process even further. Adjust oven rack to lowest position and heat to 325°. Pulse raisins, dates, and pecans in a food processor until finely ground. 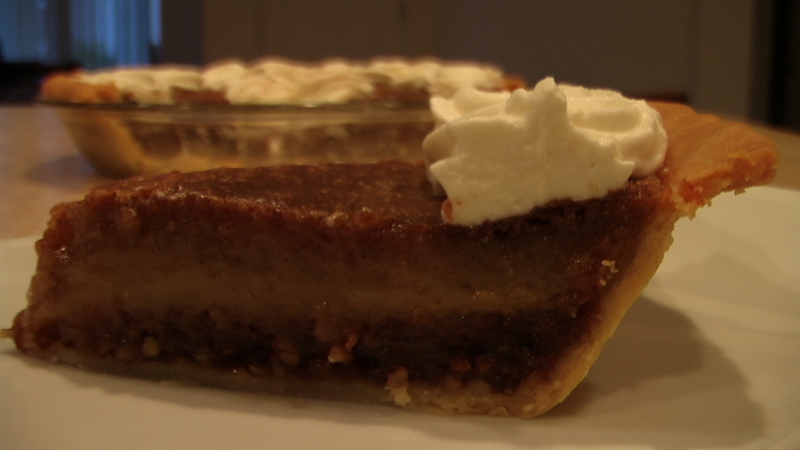 Place mixture into chilled pie shell and press into an even layer. Combine flour, cinnamon, allspice, and salt in a small bowl. With mixer on medium-low speed, cream sugar and butter together. Add in yolks, one at a time, mixing until incorporated. Add flour mixture and cream. Mix until combined, scraping down the sides of the bowl as needed. Pour custard filling over the fruit and nut mixture in the chilled pie crust. Bake until the surface of the custard appears dark brown and the center jiggles slightly, approximately 55 to 65 minutes. Cool completely on a wire rack, about 4 hours. Store covered in the refrigerator for up to 2 days. Top with whipped cream. With mixer on medium speed, beat 1 cup heavy cream, 1 1/2 tbsp. light brown sugar, and 1 tsp. vanilla until stiff peaks form, about 2 minutes. Whipped cream can be refrigerated for 4 hours. To decorate, fill a pastry bag fitted with a star tip. Pipe reverse shells around the outer edge and rosettes in the center. Dust with ground cinnamon. References: Special thanks to my boyfriend Peter for his photography and Cali Rich. Wow, that’s an old pie! R.E. Lee was a confederate officer , and U.S. Grant a Union officer. The parallel to Davis is Lincoln. President of Confederacy: President of Union; respectively. Excellent recipe by the way. Thanks for sharing. Thank you for the information and comment. I have since corrected my typo.